For many people watching football is mere entertainment, to some it's more like a ritual; but to others, its highs and lows provide a narrative to life itself. 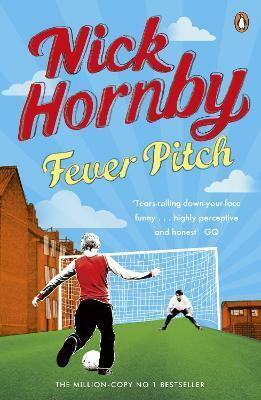 For Nick Hornby, his devotion to the game has provided one of few constants in a life where the meaningful things - like growing up, leaving home and forming relationships, both parental and romantic - have rarely been as simple or as uncomplicated as his love for Arsenal. Brimming with wit and honesty, Fever Pitch, winner of the William Hill Sports book of the Year, catches perfectly what it really means to be a football fan - and in doing so, what it means to be a man. It sits side the very finest football classics of the last twenty five years, from The Damned United by David Peace to A Life Too Short by Ronald Reng, but it is ultimately a book that defies categorization and can be enjoyed by all. Nick Hornby has captivated readers and achieved widespread critical acclaim for his comic, well-observed novels About a Boy, High Fidelity, How to be Good, A Long Way Down (shortlisted for the Whitbread Award), Slam and Juliet, Naked. His two additional works of non-fiction, 31 Songs (shortlisted for the National Book Critics Circle Award) and The Complete Polysyllabic Spree are also available from Penguin. Nick Hornby is the author of six bestselling novels (High Fidelity, About a Boy, How To Be Good, A Long Way Down, Juliet, Naked and Funny Girl), as well as a novel for young adults, Slam, and four works of acclaimed non-fiction: Fever Pitch, 31 Songs, The Complete Polysyllabic Spree and Stuff I've Been Reading. He has written the screenplays for the films Fever Pitch, Wild, Brooklyn and An Education, which was nominated for an Oscar. He lives in Highbury, north London.